Normally I like to explore a location during the day before taking pictures there at night. But the Southern California traffic robbed me of the time to do that here. Arch Rock was a little bit hard to find in the dark, but it wasn't too bad. I just had to be careful to avoid rattlesnakes. 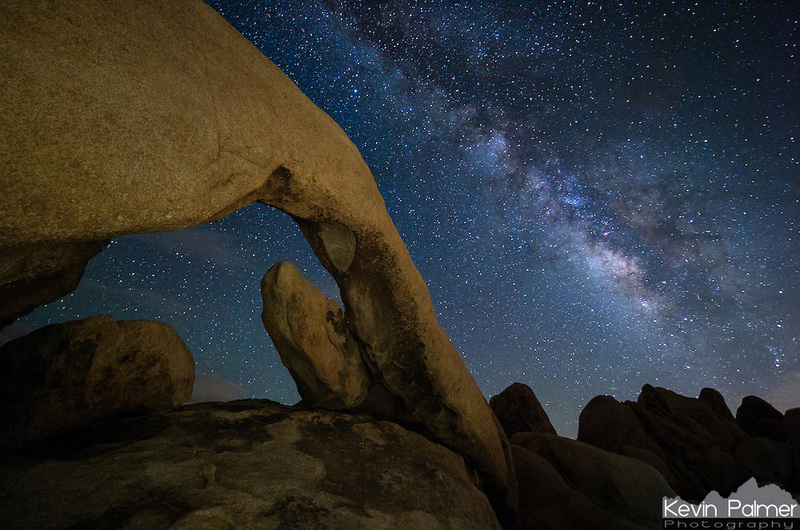 The 30 foot long arch is located near the White Tank campground in Joshua Tree National Park. The eastern part of the park has very dark skies the farther you get from the desert cities. To illuminate the scene, I shined my headlamp on the rock wall opposite the arch. A soft, warm light was reflected backwards. I was grateful the skies cleared up long enough to see the milky way. A few minutes after this clouds started to cover the sky as monsoon thunderstorms moved past the area.